The Apple iPad is one of the most successful device that has been introduced by Apple to the world. Now the iPad 2 finally came on on March 2, 2011. What features do the Apple iPad have? Are you excited about the wizard iPad 2? Actually, the second generation Apple iPad (iPad 2) is thinner and weigh less than its predecessor. iPad 2 features a dual-core processor, a better screen, more RAM and storage, a front-facing camera, and a rear-facing camera. The high-resolution screen makes iPad 2 perfect for watching movies, TV shows, music videos, and more. Want to backup DVD to iPad 2 for playback to experience the most shocking visual feast for the eyes? Before you 1:1 digitize DVD to iPad 2, you need a properly iPad DVD ripper to convert DVD into a format iPad 2 supports. MacX DVD Ripper Pro is updated to fully compatible with the iPad 2/3/4, and even the newly released iPad Air and iPad Mini with Retina display. It is the best Mac DVD to iPad 2 Ripper to rip DVD to iPad 2/3/4, iPad Pro, iPad mini 4, iPad Air 2 etc perfectly. Easily rip Disney/Paramount etc protected DVD movies to iPad 2 supported formats like MP4, MOV, AVI, H.264 etc on Mac devices and Windows (10). Fast and no quality loss! 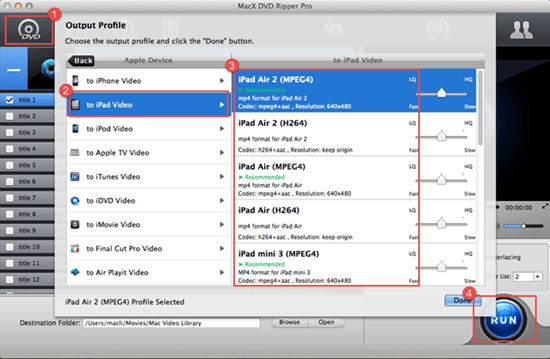 MacX DVD Ripper Pro makes DVD to iPad conversion routine quite simple on Mac computer. The following will take this DVD to iPad 2 ripper Mac for example to introduce the step-by-step on how to make a digital copy of dvd to iPad 2. After free downloading DVD to iPad 2 ripper, click "DVD Disc" button to import the DVD files after you insert the DVD. You can also load DVD folder by clicking "Path" button. Select the output video you desire. Here we choose "to iPad 2". It also helps to rip dvd to iPad Rro/mini 4/air 2, as well as iPhone X/8/7/6s/6/Plus, Android devices etc. After finish the above steps, click "RUN" button to start DVD to iPad conversion, you could view the conversion progress and are able to cancel the converting process at anytime. After the DVD to iPad conversion is over, you can eventually transfer DVD to iPad via iTunes or iPad file transfer application - MacX MediaTrans.